Degradation of water quality due to excess nutrients in runoff is a common problem in regions with a lot of agriculture and pastureland. Improving water quality in such regions can be difficult as the timing and amount of nutrients added to waterways varies by location, weather, geology, land use, and biology. One challenge in predicting the release of nutrients are streams that are dry for most of the year and only flow during rainfall (ephemeral streams). This is because ephemeral streams cannot be monitored for water quality when they are dry and therefore are not included on river maps or targeted during environmental regulation. 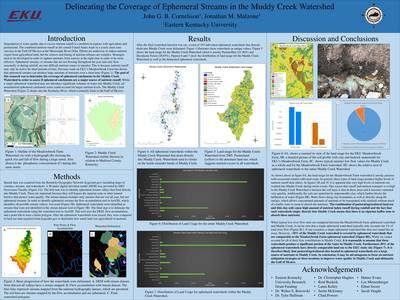 In this research, geographic information software (GIS) was used to delineate all of the ephemeral catchments that flow into Muddy Creek in order to estimate how important these streams could be in degrading water quality. Watersheds were delineated using a digital elevation model for the region and the ArcGIS hydrology toolbox. Ephemeral reaches were identified by finding watersheds that were not included on the National Hydrography Dataset, which only includes streams that are wet all year. The land use in the watersheds was also included using the land cover map for Kentucky. Results indicated over 300 ephemeral watersheds with agricultural or pastoral land uses. The implication of this would be that the collective nutrient contribution of all of these ephemeral streams may be an important target for improving water quality.